There’s a common misconception that the American chestnut is extinct. That’s not the case. The large trees may have been decimated by the blight, but you can see plenty of little trees in the Appalachians. Alas, those small trees will eventually succumb to the blight as well before they can reach the large sizes of yesteryear. But here’s the thing about the American chestnut. It’s incredibly optimistic. The American chestnut is not afraid to try again. The blight will take its the branches. The blight will take its trunk, but when the tree “dies”, the roots send up another shoot to give life another whirl. It’s almost as if the tree shrugs and thinks, “Well, that sucked.” and then moves on. Chestnuts Aren’t Afraid to Try Again – With the larger trunk blighted, new shoots give it another go. The weeks following our wedding was an exciting time in the chestnut arena. We got to watch as our seeds germinated. I was amazed at how from the get-go the tiniest baby leaf already looked like an American chestnut. It had itty bitty curved teeth! 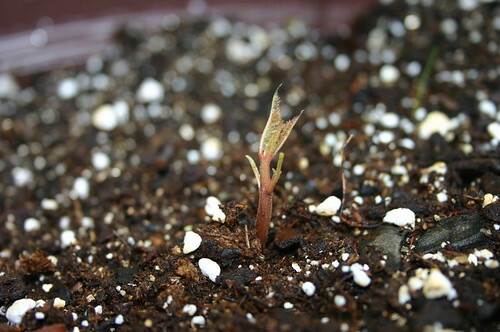 Baby D4-28-30, 16 days After Planting – Aww… It’s Baby Leaves Already Have Teeth!!! We slowly exposed our baby trees to full sun and full wind. We watched them peek out of the top of their pots and continue to grow. I remember how giddy I was when I realized I could clearly make out the chestnuts when we drove down Dawson Street before we reached our road! 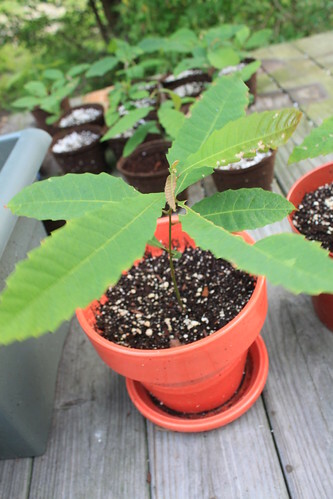 In June, we celebrated one of the chestnuts reaching 12″ tall. Leaving for a trip, I gave the trees extra water. It turned out to be an unnecessary gesture. It rained the whole time we were gone. Worse– the holes in the bottom of our pots were obstructed so all that water queued up. 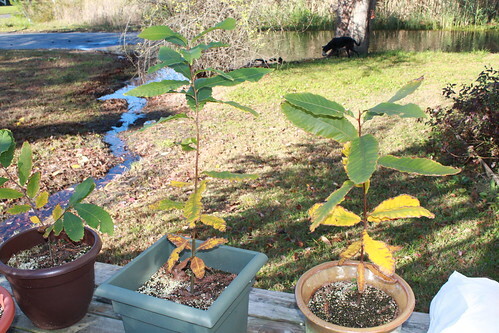 This was not good– American chestnuts are sensitive to overwatering. 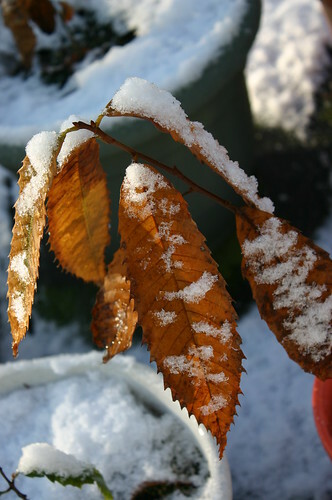 When we returned home, our formerly happy chestnuts were far from happy. And just like that, they died. I felt… horrible! The American Chestnut Foundation had put so much work and research into those nuts and I turned around and killed them. I literally lost sleep over it, a fact I couldn’t hide from my mother thanks to Mark Zuckerberg (“Why were you on Facebook at 4 AM?!?”). After a few days, I realized there was only one thing I could do to feel better. I needed to confess! I called up The American Chestnut Foundation and apologized to the poor employee who happened to answer the phone. She had a scientist call me back to gather up some data about my potting mix, my fertilizer and pot sizes. All I wanted from the conversation was a means to appease my guilt. I ended up with a lot more. At the end of our phone call, the scientist surprised me, an established tree killer, by offering me more seed. Our second wave of chestnuts aren’t from the “Restoration generation” (B3F3). They are still 15/16 American, but are members of the earlier B2F3 generation. On the surface, it looked like the small peat moss pots did the trick, but I will note that all of our tallest seedlings were ones that were planted in the bigger pots from Day One. 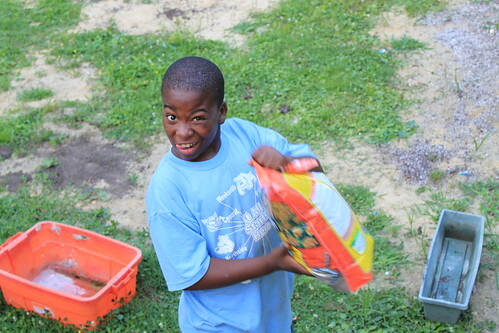 With the help of Jacal, we planted 48 nuts. Some of them had crazy long radicals. We cut the radical down to 1/2″ for 11 of the nuts. The remaining seed we left the radicals completely in tact. Two nuts were moldy and didn’t have radicals. One nut’s radical broke. Out of those 48 nuts, we had 45 germinate. Yup– the moldy nuts and the one with the broken radical were the ones that did not make an appearence. 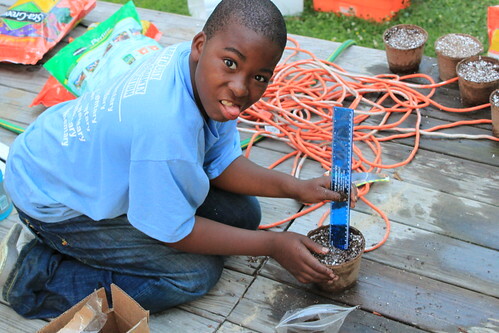 Our soil mixture was the recommended 1/3 peat moss, 1/3 perlite and 1/3 vermiculite. Jacal helped me mix it up. Germination was substantially faster this time. In March, it took our seeds roughly 13 days to poke up out of the soil. The June wave, took just 4 days before baby chestnuts made their above soil debut. Chestnuts like slightly acidic soil with a pH between 4.5 to 6.5. For fertilization, I used MiracleGro for Azaleas, Camellia, Rhododendron (it’s geared for “All Acid-Loving Plants”). It was recommended that I fertilize them every other week. Once the hurricanes and tropical storms started coming our way and the plants were getting watered frequently from nature, they were only fertilized once a month (the fertilizer was mixed in water and I was fearful of overwatering). I did not use any kind of pesticide this summer, but it probably would have been welcomed by the chestnuts. A couple of them were deemed tasty by insects and I did find two cankerworm squatters. Of the twenty-two chestnuts I kept here in Elizabeth City, I did have three casualties. Of the survivors, some have done better than others. 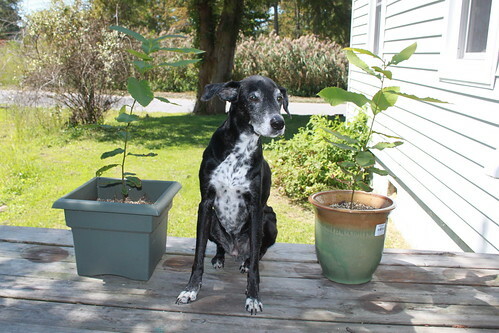 My tallest right now was planted on June 17, 2010 and on November 29th, it was 29″ tall. I may have planted these guys late, but apparently they got to grow a little longer here in warm North Carolina. On Facebook, I saw someone’s Restoration chestnuts in Traverse City, Michigan yellowing in early October. Our chestnuts didn’t start to yellow until nearly a month later. I first spotted changing leaves on November 17th. 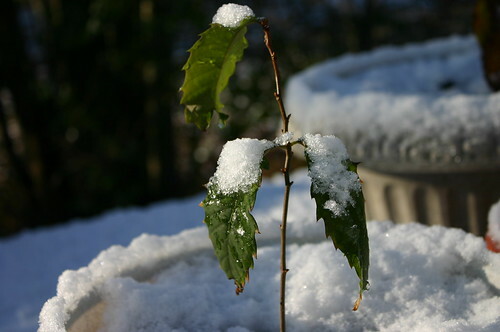 The chestnuts got their first glimpse of snow of December 5, 2010. As you can see, some of them are STILL sporting green leaves! And there you go! Sometimes trying again can be terrifying. Sometimes trying again seems hopeless. But sometimes… sometimes trying again will bring you something to smile about. Entry filed under: American Chestnut, American Chestnut Foundation, Neighborhood Kids, Restoration Chestnut, rvw10, trees. Good for you for trying again! I find the whole endeavor of trying to breed resistance to the blight just fascinating. Such a long-term undertaking, and so many people volunteering to help…and it sounds like good progress is being made! Fascinating! I love your idea of the chestnuts as a metaphor for the importance of trying again. Where I live, in the southeastern U.S., we’re currently losing all of our native red bay trees to an exotic beetle. Hopefully someday someone will do for the bays what the American Chestnut Foundation is doing for the chestnut. Have you read the novel Prodigal Summer by Barbara Kingsolver? 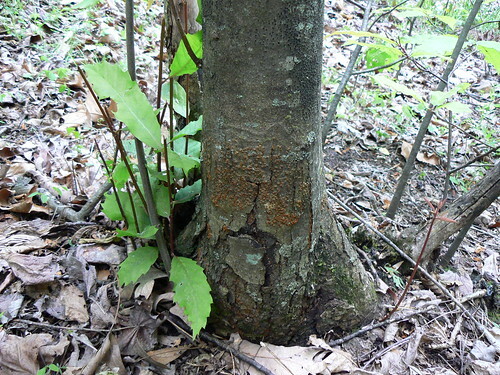 The fate of the American Chestnut plays a major symbolic role in it. I love this story Vicky, for its theme of perseverance and the role of children in growing your chestnuts. That’s awesome. When are you going to give up the silly technology career and become a full-time arborist? You are awesome!! And what a quick response to my request about more info about your chestnut trees!! I think you posted this like a day later!! It’s been in my Inbox marked as unread since I really wanted to give it enough time to thoroughly read and take in. I love it!! One of my all-tiime favorite parts is: “…the scientist surprised me, an established tree killer, by offering me more seed.” haha! I’m so glad that scientist did!! I also LOVE the neighborhood kid story. Plants seriously do contribute to happiness I think, especially itty bitty baby plants! When I worked as an environmental consultant (before teaching, before I was a mommy), I had so many plants in the office that they called my corner “The Jungle”. I loved it. There’s nothing like some fresh oxygen and cheer in a drab dull office. And, as you discovered, there’s nothing like some fresh survivor oxygen and cheer on a back deck, shared with the neighborhood!! 🙂 Where do you plan to plant your trees when they reach the appropriate size? I love this story and I totally commend you for doing what you’re doing. You’re so scientific about it, too… it brings back fond memories. Maybe when Maddie is a bit bigger, we can do a similar project/experiment up here in Maine. Thanks, as always, for sharing! I have really, really enjoyed this post even though I have never read anything about chestnuts before. I admire what you are doing and the honesty of your post. That alone is inspiring and good on you for trying again! Thanks for sharing this story! How did you get the seeds for growing? Do you have links to suppliers? I hope this helps! 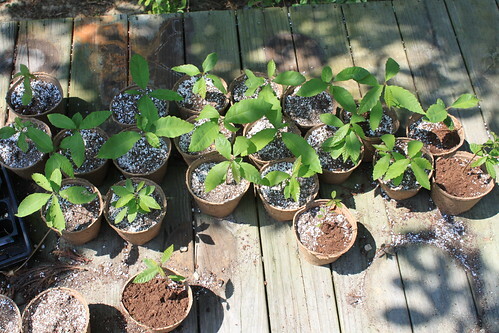 Thanks for your interest in the American chestnut!